Indicator A2: How many students are expected to complete upper secondary education? Indicator A3: How many young people are expected to complete tertiary education and what is their profile? Indicator A4: To what extent does parents’ background influence educational attainment? Indicator A6: What are the earnings advantages from education? Indicator A7: What are the financial incentives to invest in education? Indicator A8: How are social outcomes related to education? Indicator A9: How many students complete tertiary education? 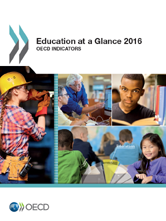 Indicator B3: How much public and private investment in education is there? Indicator B6: On what resources and services is education funding spent? Indicator C4: Who studies abroad and where? Indicator C6: How many adults participate in education and learning? Indicator D5: Who are the teachers? Indicator D6: Who are our school leaders and what do they do?